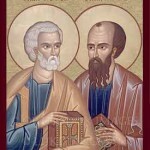 The Apostles Fast is a fast which begins on the second Monday after Pentecost or the Monday after the Sunday of All Saints (May 28th) and ends on June 29, the feast of Saints Peter and Paul. The duration of this fast varies, depending on the date of Pascha. 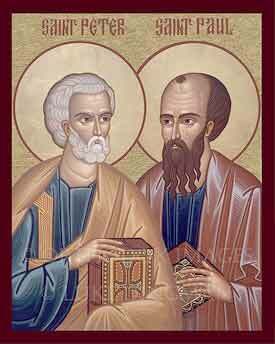 This fast commemorates the preparation of the Apostles for preaching God’s word to the whole world. According to Sacred Tradition, as part of their preparation, they began a fast with prayer to ask God to strengthen their resolve and to be with them during their missionary efforts as they spread the Gospel. Exemption from the fast: under 14 years of age, over 60 years of age, pregnant, breast feeding, any health risk due to disease, dispensation given by the Pastor. Fasting without prayer is demonic, all one does is hurt the body. Fast and Pray! Minimum fast is no meat on Friday. If you are experienced with fasting and praying: The law of abstinence forbids the use of meat, permitting the use of eggs and dairy products. Abstinence is to be observed on all Wednesdays and Fridays. If you have struggled through the minimum fast and abstinence, and desire a spiritual challenge, Strict abstinence is that challenge. Strict abstinence forbids the use of meat, eggs and dairy products. Strict Abstinence is to be observed during the week for those who are able but wine and oil are allowed on Tuesday and Thursday; fish wine and oil is allowed on the weekend. Eucharistic Fast is to be done anytime when the Divine Liturgy is celebrated. The minimum fast is one hour before reception of the Holy Eucharist. Although, our tradition is to fast from midnight to the reception of the Holy Eucharist. For those who are able, strict abstinence should be observed.